I tried the recipe using skim milk and real butter, sifted the flour before measuring and measured the butter after melting it. I used a preheated nonstick pan. I expected the batter to be runny, having made crepes many times over the years. My only concern was the butter that then congealed a bit in the metal bowl, so I gently heated it on a burner and stirred with a wisk. 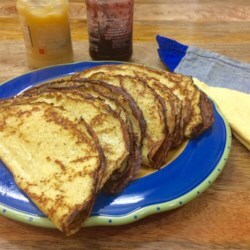 You have to be patient with this recipe and not try to mess with the edges of the pancake until they begin to pull away from the pan or until the very edge begins to brown a bit. I had my pan on a bit high, so they didn't quite look like the IHOP ones I love, but they tasted awesome! I was able to work a silicone spatula under them to the middle and flip them without cutting. When done, I folded them in quarter and put them on a plate in a 170 degree oven until I got all of them made. I sprinkled them with powdered sugar and heated apricot jam. Do I plan on keeping this recipe? Heck yes! I'm going to try it next time with vanilla or maybe try the OJ suggestion too for a change. However, the recipe is really great as is. The right tools will help keep the frustration at a minimum.